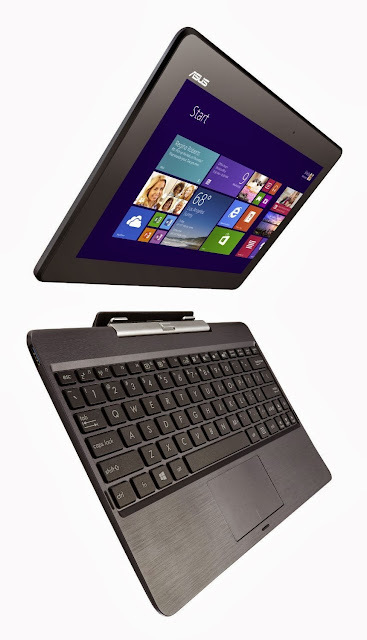 The Asus Transformer Book T100 is two computers in one - tablet/laptop hybrid. The Asus Transformer Book T100 features a brilliant HD 10.1 inch IPS multi-touch display with 178-degree viewing angles for outstanding clarity. that will run on a quad-core Intel Atom Bay Trail-T Z3740 quad-core processor for smooth multi-tasking performance and incredible energy efficiency that can last up to 11 hours1 on battery power. The ASUS Transformer Book T100 boasts 2GB of RAM, a 1.2-megapixel front-facing camera, and no back camera. Ports on the tablet itself include Micro-HDMI, Micro-USB, a microSD card reader, and, of course, a headphone jack. Stereo speakers can be found on the back, and the keyboard includes a single USB 3.0 port. It is a performance notebook with latest Windows 8.1 operating system and preinstalled with Microsoft Office 2013 Home & Student. The Asus Transformer Book T100 weighs about 1.2 pounds and measures 0.4 inches thick. When you add the keyboard dock the whole thing comes to about 0.9 inches thick and 2.4 pounds — or about the size of a relatively small netbook. It’s expected to ship starting October 18th - the day of general Windows 8.1 availability, but now you can pre-order a Transformer Book T100 with 64GB for $399 from Amazon.